Tunas Mekar is a 30-year-old 501(c)(3) non-profit, all-volunteer organization that is self-funded by performances and workshops throughout the year. Our mission is to learn and perform the traditional and new music of Bali, Indonesia and offer a cultural exchange about the unique island of Bali. Please consider making a tax-deductible contribution to support us in our performances, educational efforts and cultural exchange. Terima kasih! Based in Denver, Colorado, USA, Gamelan Tunas Mekar is a community ensemble under the direction of Balinese composer and Artist-in-Residence I Made Lasmawan. Tunas Mekar performs traditional and new music of the island of Bali, Indonesia. Modeled after typical village groups found throughout Bali, and learning by traditional methods, Tunas Mekar provides American audiences the rare opportunity to experience one of the world’s most beautiful and sophisticated performing arts. Founded in 1988, Gamelan Tunas Mekar plays the vibrant music that traditionally accompanies temple festivals and traditional life-cycle rites, including tooth filings and cremations, as well as more recreational events. Tunas Mekar performs this rich music throughout the United States in schools, at community cultural festivals, private events and specially produced concerts, pursuing the goals of musical perfection and human cooperation, and raising awareness of a mysterious and magnificent culture. Learn about the instruments on which Tunas Mekar performs and about gamelan music, see Tunas Mekar’s upcoming concert schedule, and listen to music performed on various orchestras (MP3 format) as you browse these pages. 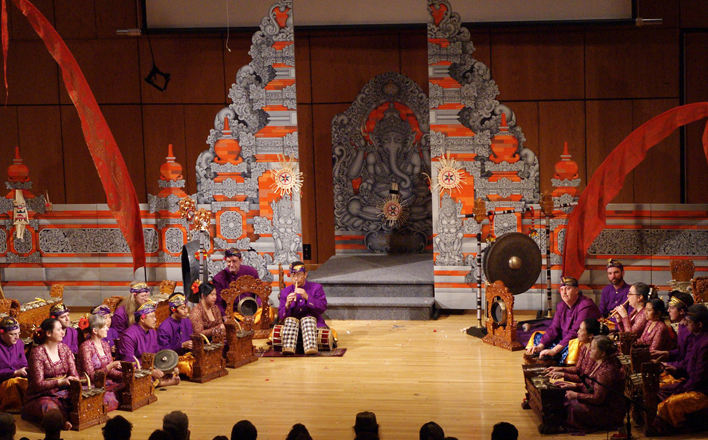 Gamelan Tunas Mekar began under the tutelage of Wayne Vitale, director of the large community gamelan Sekar Jaya based in El Cerrito, California. In 1990, the group was named by I Ketut Madri, a musician from the village of Pengosekan in central Bali. As the group’s first Balinese teacher, he was asked to provide a name, and his choice was appropriate. “Tunas” means a stored bit of life force, such as a seed of a floral bud, and “Mekar” means to put forth. This name has given the group its sense of identity: a wayward seed, blown far from the parent plant and landing on unfamiliar soil that has nonetheless produced an amazing flower. 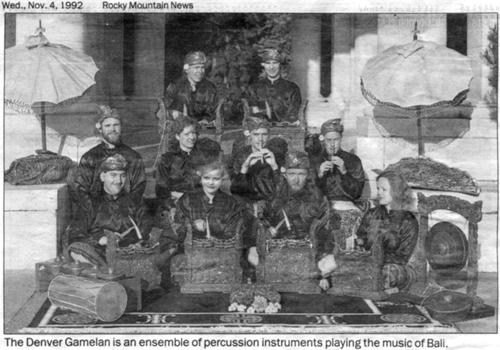 “The Denver Gamelan” circa 1992. Photo by the Rocky Mountain News. In August of 1993, Gamelan Tunas Mekar was dedicated in a traditional ceremony by I Made Lasmawan, Balinese master drummer and Artist-in-Residence with the group since 1992. The current ensemble, under the instruction of Lasmawan, is comprised of both professional musicians and non-professional “students” of gamelan music. True to its name, the influence of Gamelan Tunas Mekar in bringing Pak Made to the Rocky Mountain region of the United States has brought to life a number of college and university gamelan ensembles (all directed by Pak Made) including a Gamelan Tunjung Sari at Colorado College in Colorado Springs, Gamelan Candra Wyoga at the University of Wyoming at Laramie, Gamelan Genta Kencana at the University of Colorado in Boulder, and Gamelan Manik Kusuma at Metropolitan State University of Denver. In 1996, the governor of Bali invited Tunas Mekar to perform at the eighteenth annual Bali Arts Festival in the Capitol City of Denpasar. Tunas Mekar thus became the second American gamelan to be accorded this honor. The success of this performance, as evidenced by the large and enthusiastic Balinese audience, lifted Tunas Mekar to a new level of understanding and confidence. A live telecast of Tunas Mekar’s performance at the eighteenth annual Bali Arts Festival in Denpasar, which included performances by up-and-coming Balinese dancers, made Tunas Mekar instantly well known around the island. Subsequent articles in The Bali Post and Gatra, Indonesia’s most widely read magazine (see translated review), further cemented the group’s reputation as “the next big thing” on the global gamelan scene. Visit our Media / Press Page for a press Description, Photos, Logos and Audio samples. Tunas Mekar is a 501(c)(3) organization, and all donations to the ensemble are tax-deductible. We greatly appreciate your support.